The pre-Columbian history of the southwestern United States has been easier to trace than the history of many other regions for three main reasons. First, the arid nature of the land has made it vulnerable to erosion exposing a wealth of Native American artifacts. 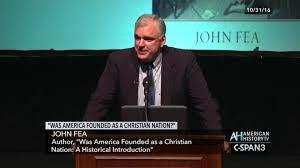 Secondly, the Spanish passed through the region in the sixteenth century, leaving detailed accounts of the people they encountered three hundred years before the United States would acquire that portion of the continent. Lastly, most of the pre-Columbian tribes have survived in the same region and have preserved many of the cultural traits of those pre-Columbian societies. This section will cover the four main ethnicities of Indians that inhabited the Southwest in the period leading up to European discovery. They included the Anasazi or Pueblos, the Hohokams, the Yumans, and the Athapascans which included the Navajo and Apache. Around 200 A.D., the Anasazi culture began to develop in what is today considered the four corners region, marking the convergence of the states of Utah, Arizona, New Mexico, and Colorado. The word Anasazi is from a Navajo word meaning "old peoples”. The Anasazis lived at first in caves, but as time went by, they began building large communities in valleys, on mesa tops, and in cliff walls, some of which are in what are now Mesa Verde, CO, Kayenta, AZ, and Chaco Canyon, NM. The Chaco Canyon settlement was the most impressive and may have had as many as eight thousand people at its zenith. Their buildings were massive apartment complexes built congruously, sometimes four stories high and depending on the size of the village, could contain anywhere from twenty to a thousand rooms. This allowed the easy flow of people from one dwelling to the next without having to go outside, which was especially helpful during bad weather or an enemy attack. This level of cultural success as with all cultural advances came about because of a food surplus. Although the soil was not especially conducive to agriculture, the Puebloans had learned to make the most of it through the advantage of a settled, permanent lifestyle. Their staple crops that they grew in abundance were squash, beans, and corn. The need for rain and good harvests prompted the Puebloans to be extremely devout and ritualistic. An essential part of their building complexes were kivas, which were round, underground rooms used for religious and ceremonial purposes. In the middle of the room was a hole in the ground which represented the gateway to the underworld. One of their ceremonies consisted of a type of initiation into manhood. A young boy would be brought into the kiva where he would be confronted with a man in a mask who would whip him to expunge the evil from him. He would then be let go with a strong warning to never tell anyone what had happened. The boy would later be brought back as a teenager and the episode would repeat itself; only this time, after the whipping, the masked man would reveal himself as the village shaman and the boy would then whip the shaman. Beginning in the thirteenth century, the Anasazi culture began to decline and the people slowly abandoned their large complexes. War and disease are usual candidates for civilization decline, but a thirteenth century drought in the arid Southwest may have contributed to their disappearance. Whatever the cause, by the fifteenth century, the Anasazis had split into various, smaller tribes, prompting the Spanish to call then the Pueblo Indians because they lived in villages. 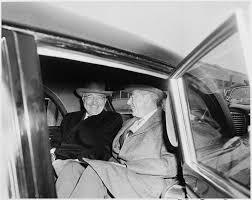 However, they never lost their essential culture or architectural style. Much of the architecture of the Anasazis had been preserved in the villages that the Pueblo tribes such as the Hopi inhabited, although never on as grand a scale. The Hohokam culture existed in what is now central and southern Arizona, to the west and south of the city of Phoenix. The word Hohokam means “those who have gone” in the language of the Pimas, who are believed to be their descendents. Gathering anthropological evidence on the Hohokams has proved difficult since they cremated their dead. Like the Anasazis who first lived below ground in caves, the Hohokams’s first homes were in pithoues. As time went by, they began building above-ground homes which were inter-connected like those of their neighbors to the north. However, these villages never reached the level of sophistication as those of the Anasazi. What is remarkable about this group of people is that they were excellent farmers, although they occupied the driest land in all of North America. There is no evidence to show that that area was ever any less dry or hot than it is now and today, it averages ten inches of rainfall a year and regularly gets over a hundred degrees in the summer. The Hohokams were able to farm their land only by having massive amounts of canal irrigation. Theirs was the only canal irrigation that is known to have existed in pre-Columbia North America. One Hohokam canal that has been found stretches for three miles, but is believed to have gone as far as sixteen miles at one time based on the distance to the village known as Casa Grande where it is believed to have provided water. Another interesting aspect of Hohokam culture is the ball court, similar in shape and size to the Mayan ball court. According to Spanish descriptions of the Mayan game, points were accrued by passing a rubber ball through vertical rings without using one’s hands or feet. The discovery of a rubber ball at a Hohokam site in Arizona has shown fairly conclusive evidence that there was cultural contact between the two peoples at least as early as 500-900 A.D. It is possible though, that the Mayans exerted considerable cultural control over the empire based in Teotihuacan in the same way that the Greeks had enormous cultural influence in the Roman Empire. It would make perfect sense given the technological advancement of Teotihucan for that city to have extended its control or at least its customs north of the modern U.S.-Mexican border. While this would be difficult to prove conclusively, it is generally accepted among scholars that there was significant influence on the Hohokam culture by the native, Mexican societies. Some have even theorized that the Hohokams themselves migrated north from Mexico and displaced the original inhabitants who would have most likely been Yumans or Anasazis. Whatever may be the case, around 600 A.D. was when the Hohokams began building their extensive irrigation canals, Mayan-like ball courts and even pyramid-like earthen mounds that resembled the truncated pyramids of the Mesoamerican cultures, all about the time of Teotihuacan’s zenith. Besides canals, the Hohokams also produced elaborate pottery and ornaments which they used for decoration as well as trade. They used lava to make utensils, tools, and weapons. One thing that sets them apart from the Anasazi is that there is little evidence of basket weaving among the Hohokams, which was something that the Anasazi specialized in from the times of our earliest knowledge of them. Around 1300 A.D., the Salado tribe which was part of the Pueblo culture moved from present-day, east-central Arizona right next to the Hohokams. This produced a unique situation in that the two peoples lived in peace with one another without one dominating or assimilating the other. Furthermore, they also did not create a hybrid culture, but maintained their own separate ways of life and cultures, each tribe no doubt maintaining its own separate language as well as if they had never come in contact with one another. Mutual influence was not entirely lost however, the Saladoans worked on the irrigation canals along with the Hohokams. They also brought Puebloan architecture with them and constructed large, multi-storied houses like those of the Anasazi, only they adapted to the environment by using adobe brick rather than stone. The “Great House” at Casa Grande, Arizona was the larges built by the Saladoans, standing forty feet tall, forty feet wide, and sixty feet long with three stories and sixteen rooms. Puebloan architectural traits of the Saladoan were picked up by the Hohokams who began building more above-ground houses with multiple rooms. Furthermore, old traits of Hohokam culture, including the ball game began to slowly disappear. For unknown reasons, around 1400-1450, the Hohokam-Saladoan society broke apart as the Saladoans moved elsewhere, leaving behind their architectural accomplishments which were soon abandoned by the Hohokams. By the time the Spanish arrived, the Pima tribe was living in the area in scattered pithouses much the same way that the Hohokams had lived before achieving their cultural peak. Despite their meager housing arrangements, the pottery and irrigational farming practiced by the Pimas show that the Hohokams did not migrate or vanish into thin air, but simply suffered a decline of civilization much the same way that the Anasazi experienced. The real reason why the Saladoans left and the Hohokam culture diminished will probably continue to be a matter or speculation. 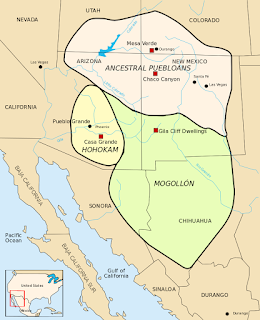 However, the Pimas have an oral tradition that their ancestors destroyed the Hohokam mound villages, including Pueblo Grande and overthrew their rulers because they had become arrogant. Many anthropologists interpret this to mean the Hohokam culture collapsed from internal unrest and splintered into smaller communities thereafter. Today, the Navajo Indians are not only the largest tribe in the Southwest, but in the entire United States. However, the Navajos and the Apaches were not native to the region. The Navajo tribe was originally from what is today, eastern Alaska and northwestern Canada. They and the Apaches both spoke languages that are part of the Athapaskan language group which is found among the tribes of northwestern Canada. It is possible that the two were once one tribe that migrated south together and later split while living in the Southwest since the Navajos had tales of their separation from the Apaches after arriving in their present location. other smaller animals to their hunting menu. From present-day, central Arizona, westward to the Mojave Desert of California, lived the Yuman-speaking people. Many of these people were hunter-gatherers who relied very little on agriculture and migrated seasonally. 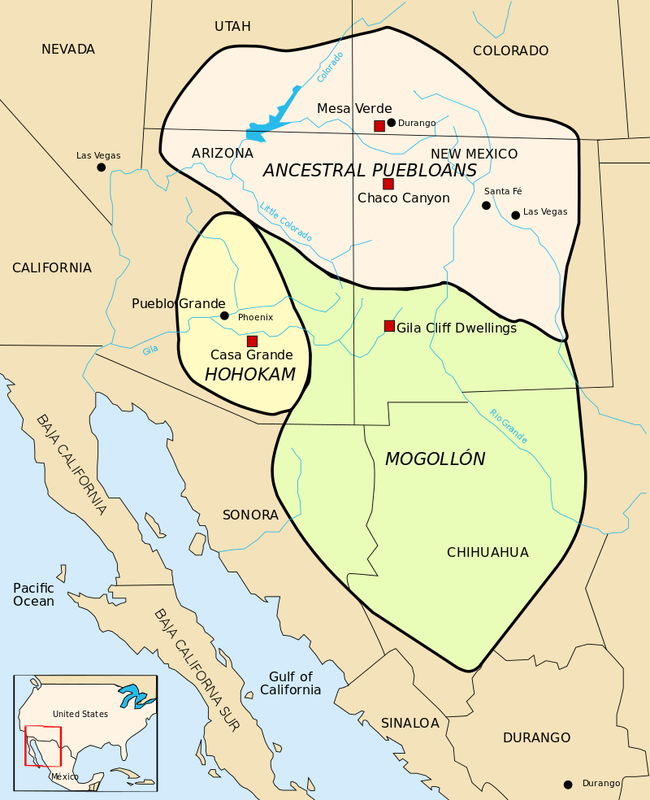 The Mojave tribe was the largest of this linguistic group and developed agriculture along the rich banks of the Colorado River. The wealth that the river brought both agriculturally as well as in fish provided them an abundance of leisure time. However, instead of building in their spare time like the Pueblos, the Mojave raided and fought. Warriors were idolized in their society and war was waged more for honor and glory than for land. This no doubt had a deleterious effect on their cultural potential. The tribes in Southern California were a part of the Shoshone category of the Uto-Aztecan, linguistic family. They were highly territorial and valued strength, endurance, and courage. Initiation rituals into manhood for boys often involved going through extreme episodes of torture since enduring pain was considered essential to manhood. The Gabrielinos (Uto-Aztecan) and the Chumash who spoke a language in the same linguistic family as the Yumans occupied the coast and islands off the Californian mainland and became expert fishermen. The Chumash were especially talented craftsmen and built boats that could take them far out into the Pacific where they fished for sea lions, seals, otters, and many varieties of tuna. They also made creative baskets and bowls. Overall, it appears the Chumash were at the height of their culture and enjoyed quite a bit of prosperity around the turn of the sixteenth century. The pre-Columbian Native American tribes of the Southwest were not all related ethnically, but they did share a common geography that tied them together culturally. The hot, dry weather of the Arizonan and New Mexican deserts forced the Hohokans to develop a form of irrigation that was millennia ahead of most North American Indian tribes. The Saladoans who later joined them adapted to their geography as well and contributed to the Hohokam culture architecturally. The Anasazi culture thrived because of advancement in agriculture which allowed them to divide labor, resulting in some of the most advanced architecture in all of North America. Shared geography also bonded the ethnically separate Gabrilienos and Chumash who made their living fishing. Although it is not certain exactly when the Navajos and Apaches settled in the Southwest, they responded differently to their environment which was possibly a reason for their split. The Navajos adopted the agricultural lifestyle of the Pueblos and Hohokams and settled down as farmers. The Apaches on the other hand, while farming minimally, continued to live as warrior nomads, hunting, gathering and raiding for their livelihood. The Southwest experienced about a thousand years of fairly advanced Indian societies, however, they had all passed their height of development and had either collapsed or were in steep decline when discovered by the Spanish in the sixteenth century. Alvin M. Josephy, Jr., The Indian Heritage of America, (New York: Alfred A. Knoph, 1968), 150. Paul S. Martin, George I. Quimby, and Donald Collier, Indians Before Columbus: Twenty Thousand Years of North American History Revealed by Archeology,(Chicago: The University of Chicago Press, 1947), 97. Alvin M. Josephy Jr., America in 1492: The World of the Indian Peoples Before the Arrival of Columbus, (New York: Alfred A. Knopf. 1991), 106, 107. Martin, Quimby, and Collier, 131. Alvin M. Josephy Jr., America in 1492: The World of the Indian Peoples Before the Arrival of Columbus, 108. Alvin M. Josephy, Jr., The Indian Heritage of America, 164. Alvin M. Josephy Jr., America in 1492: The World of the Indian Peoples Before the Arrival of Columbus, 107. Alvin M. Josephy, Jr., The Indian Heritage of America, 160. Martin, Quimby, and Collier, 175. Alvin M. Josephy, Jr., The Indian Heritage of America, 154. Alvin M. Josephy, Jr., The Indian Heritage of America, 156. John P. Andrews and Todd W. Bostwick, Desert Farmers at the River’s Edge The Hohokam and Pueblo Grande,” City of Phoenix, accessed February 20, 2014, http://phoenix.gov/recreation/arts/museums/pueblo/about/visitorinfo/materials/dfdisappearance.html. Navajo Indian Tribe, accessed February 21, 2014, http://navajo-arts.com/navajo-indian-tribe.html. Alvin M. Josephy Jr., America in 1492: The World of the Indian Peoples Before the Arrival of Columbus, 110. Alvin M. Josephy, Jr., The Indian Heritage of America, 170. Arrell Morgan Gibson, The American Indian: Prehistory to the Present, (Lexintgon, MA: D. C. Heath and Company, 1980) 76, 77.